1.) My eyes, my eyes!! Wow. This really is something special and not in a good way. Leather with snow leopard print fur? Please no. Also, it’s far too long, he looks like he’s up to something. Please never let this come back in fashion! This is actually quite painful to look at. The girl is rocking her outfit! The men, however, definitely are not. Why does everything have to be so shiny?! The weird waistcoat is definitely not it. Is this a joke or? I’m pretty sure my mom used to wear outfits like this in the 70s. Sure, men can too but either way, it’s not a great outfit in the first place! 6.) 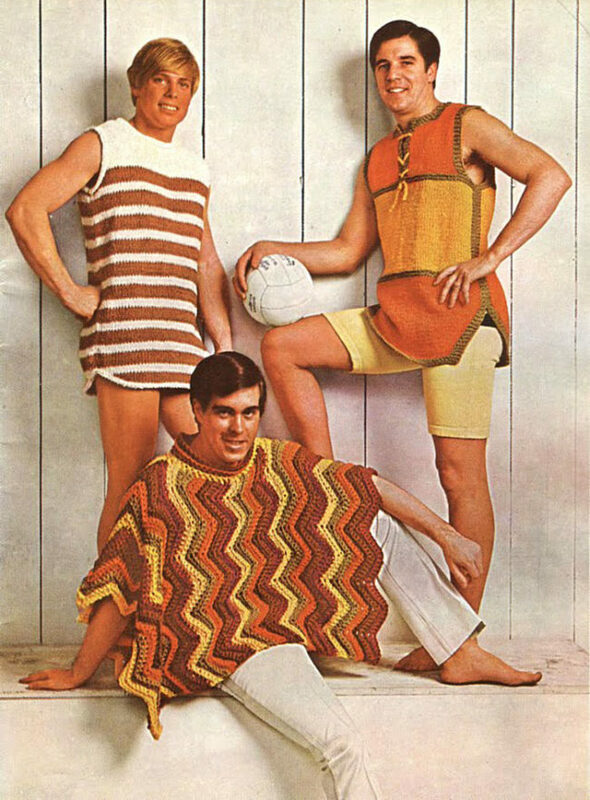 Let’s play soccer in our ponchos! Do these guys like to meet up and play sports in their ponchos or something? Looks kind of uncomfortable and sweaty. They don’t look too ‘fashionable’ either. 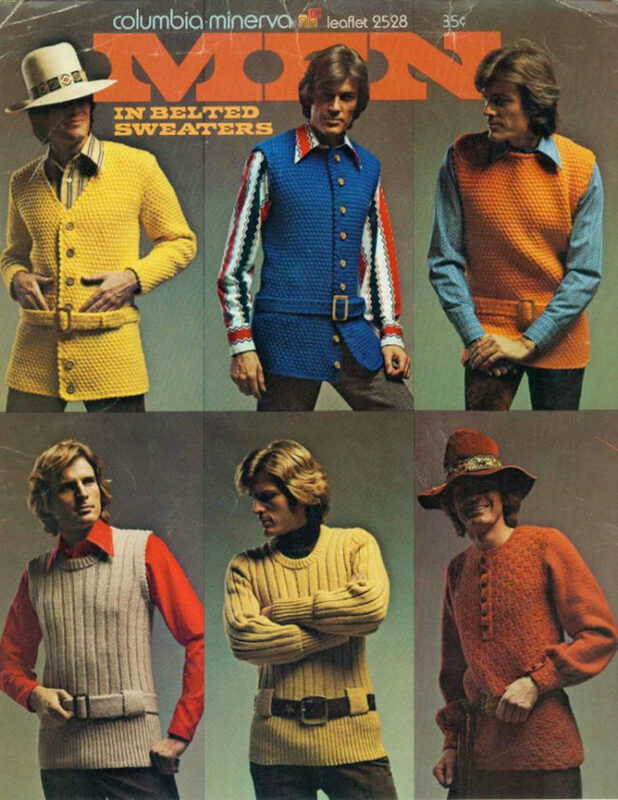 For some reason, men in the 70s seemed to have an undying love for knitted clothing. 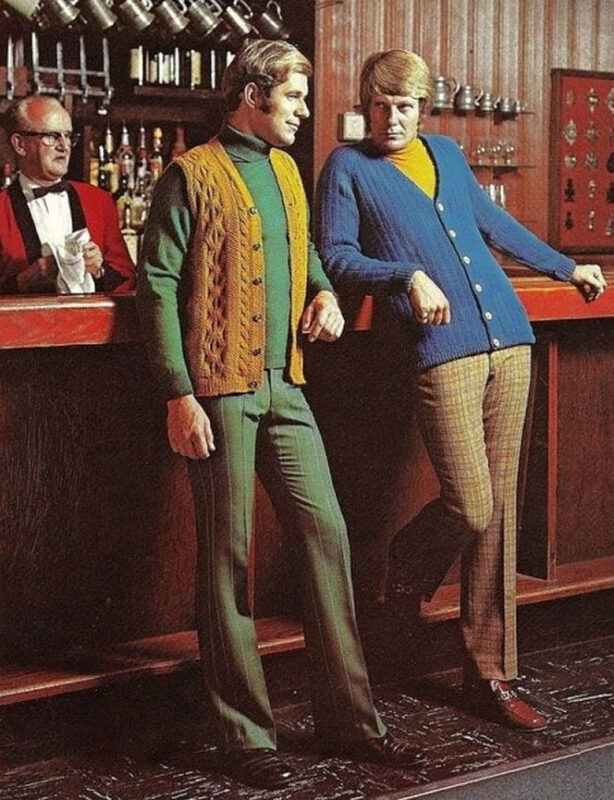 Even the bartender is looking at them like, you actually wore that? I think the world has finally found Waldo. 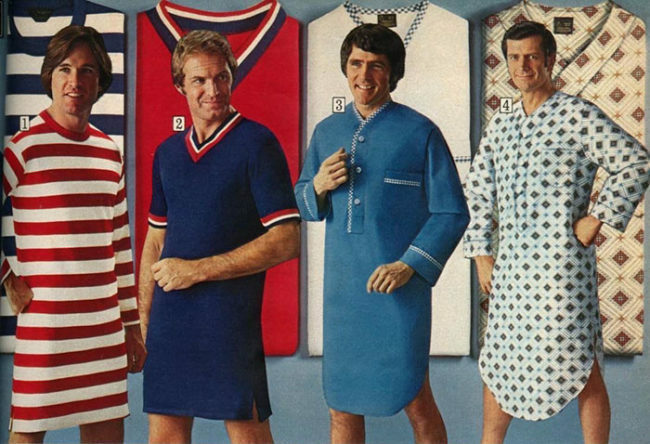 Unfortunately, we found more than we bargained for, we also found men in long nightdresses that should never been worn by anyone, ever. 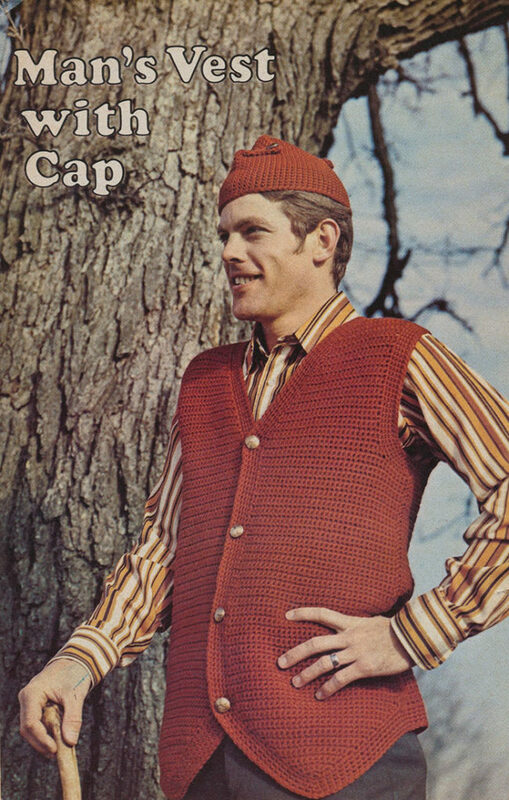 Wow, looks like Grandma was very busy during the 70s. 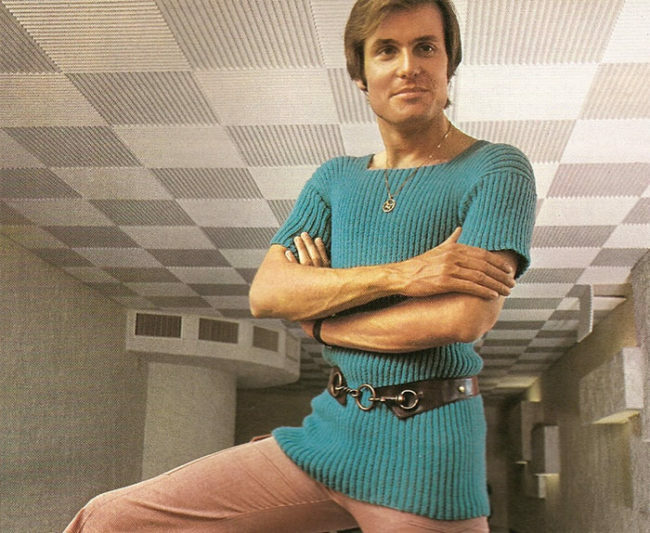 Men really couldn’t get enough of the knitwear, could they?! The belts too, wow, it really pulls it all together…not. 11.) 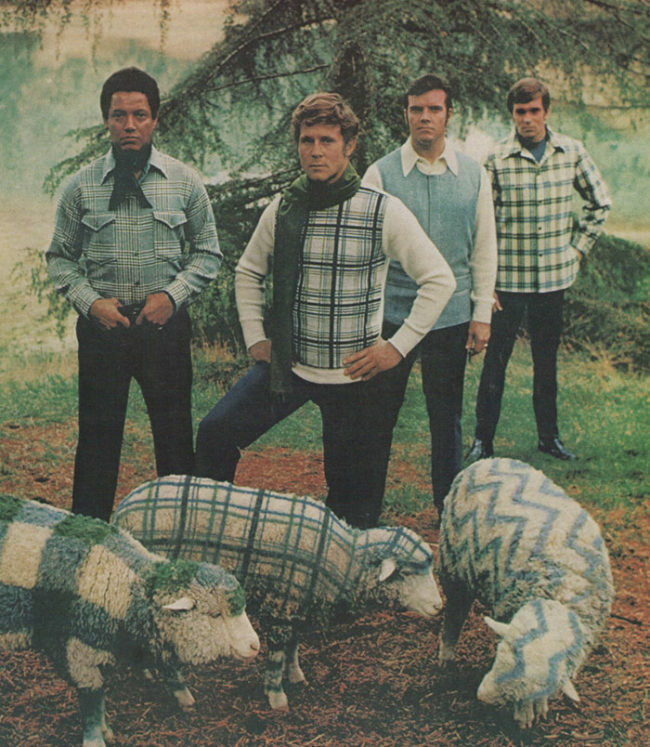 Coordinate with the sheep! 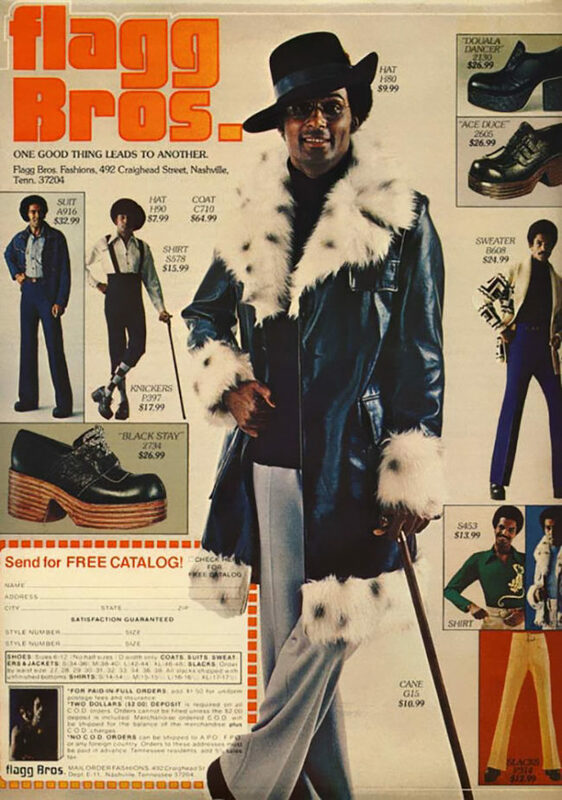 There really is a lot going on here…Why was everything so tight in the 70s?! They loved to clash their colours too. Either way, nothing looks going in this picture, it deserves to be burnt. This really is just a bit too much, mixing a floral shirt with a pink suit, oh please no! 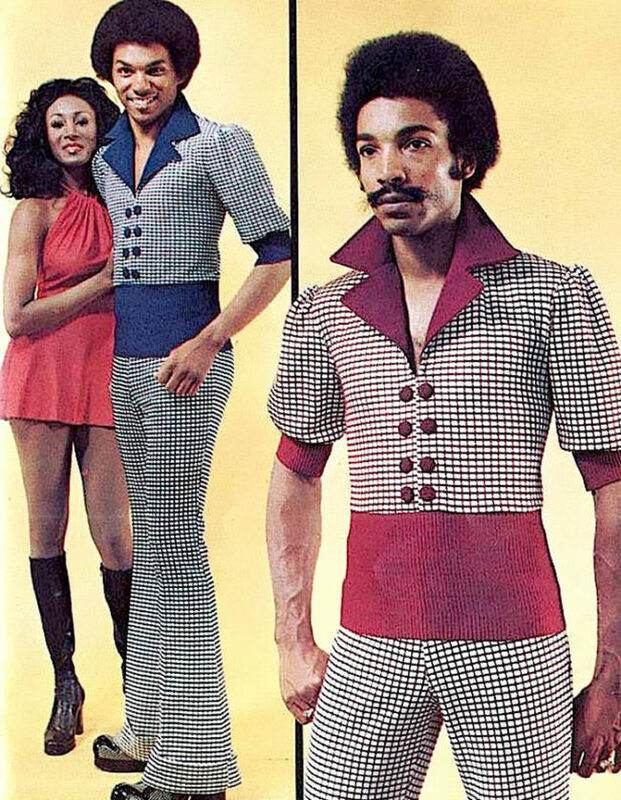 The guy looks disgusted with his own outfit and I’m pretty sure the woman is trying not to scream in horror. Have you ever wanted to match your underwear with your vest? Well, now you can! But you really shouldn’t…this definitely needs to stay in the 1970s. 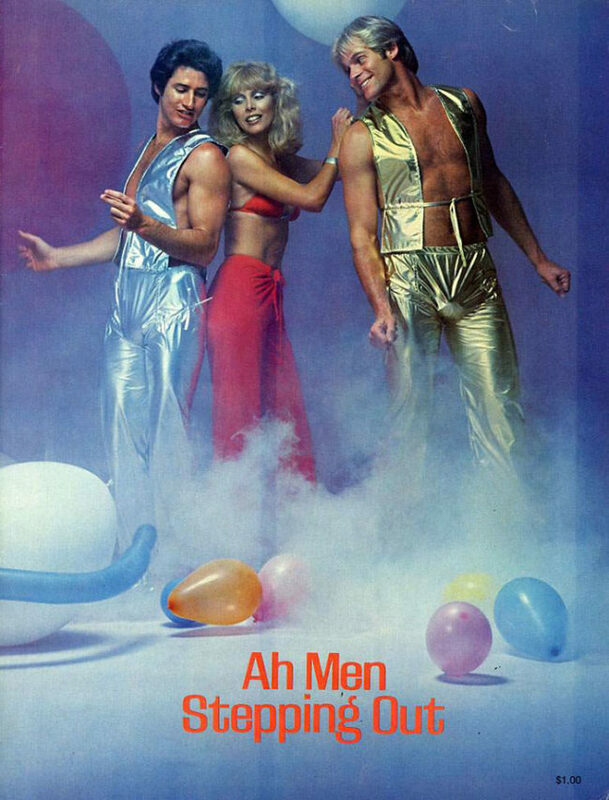 In the 70s, you had to have a lot of chest hair in order to be cool. 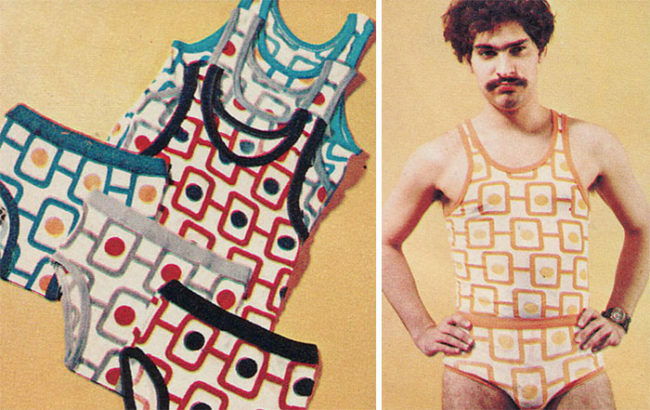 You would be even cooler if you showed it off and wore open-chested shirts like the one on the left. This is probably the grossest trend ever. 17.) Is that a construction hat? 18.) Is this the worst dressed man in history? I think we’ve finally found him, folks. THE worst dressed man in human history. Everything about this outfit is so wrong. From the checks to the colour and the collar, everything is just AWFUL. 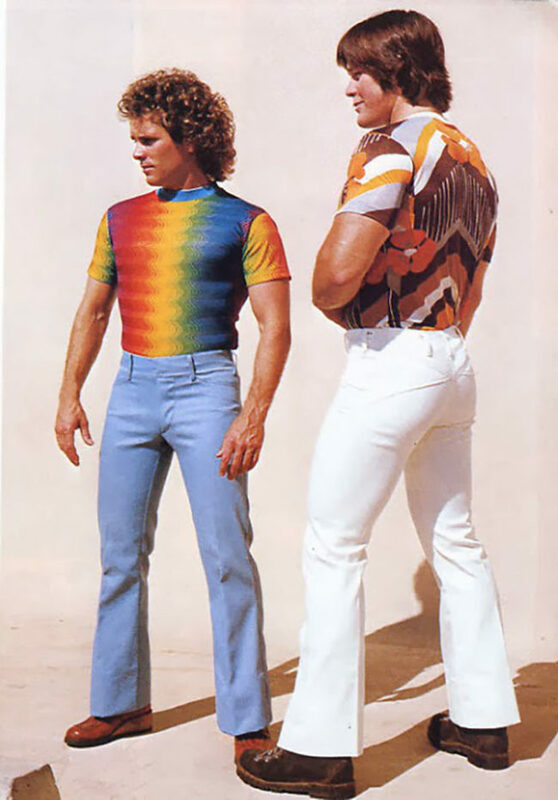 These guys really are rocking these ‘stylish’ shirts. 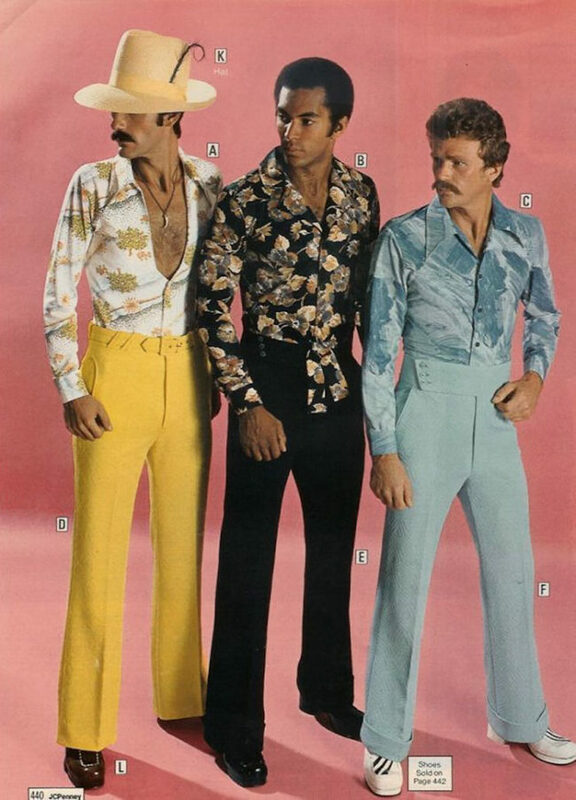 My personal favourite is the one in the middle, the necktie really does bring it all together. 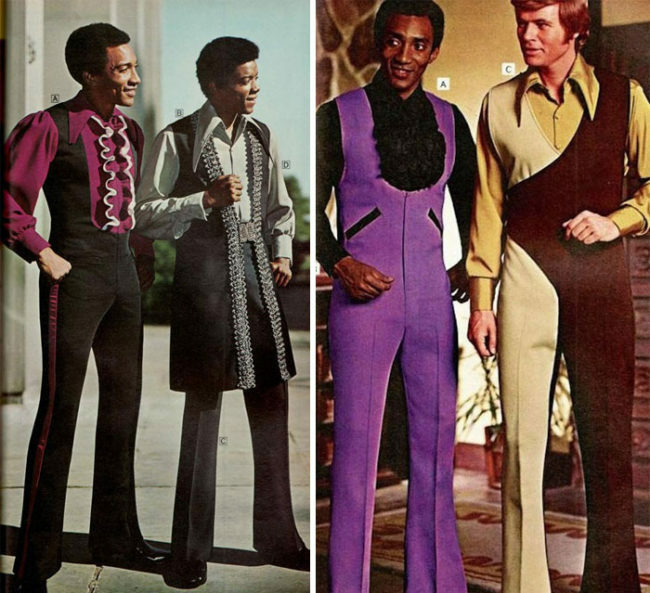 I think everyone in the 70s must have been colourblind. Also, the one on the far right looks so complicated to put on, it’s DEFINITELY not worth it. 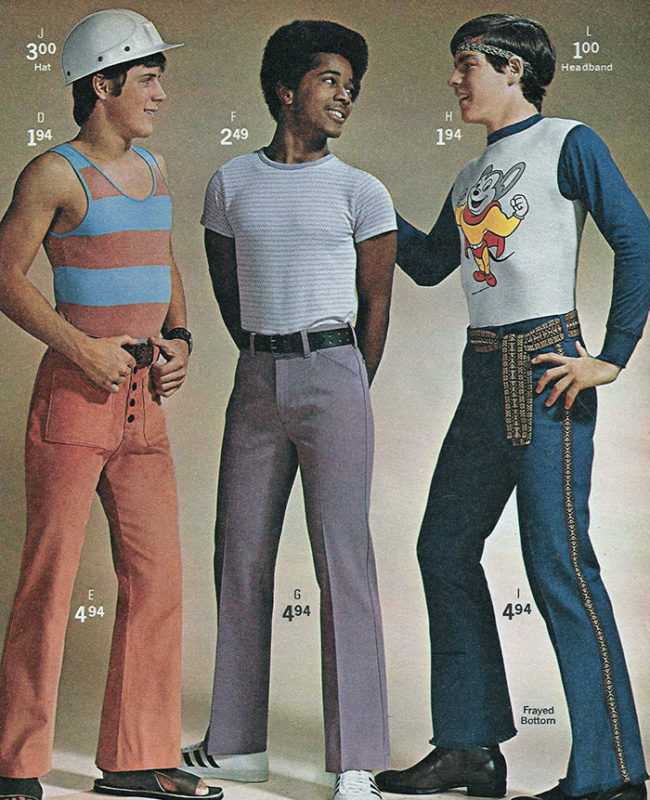 I think we should all be grateful that we are no longer in the 1970s and fashion is MUCH better now. 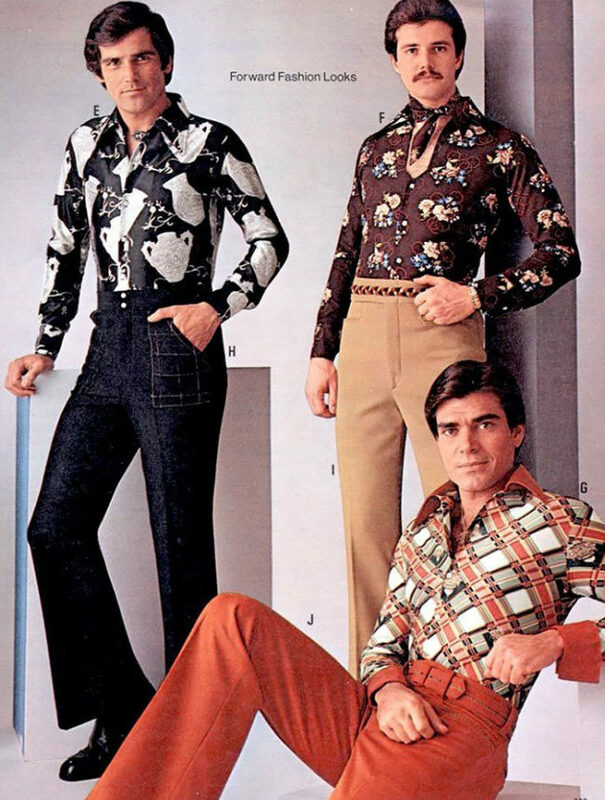 Let’s just hope the day that 70s fashion comes back NEVER happens.